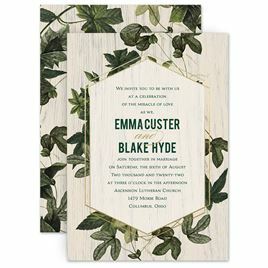 The beauty of silver wedding invitations isn't found in just their eye-catching color and luminous shine; the true beauty lies in their versatility. Silver portrays elegance like no other color, yet still fits fun and casual events. Our collection includes silver shimmer wedding cards, metallic foil designs and simple shades of grey so couples can choose a style and color that sets the tone for their wedding day. We also recommend choosing two key colors to focus on. Black and silver wedding invitations are a great example of combining two colors into one striking invitation.